Predictions about specific effects of climate change were once common - but they turned out to be spectacularly wrong so there are fewer these days. In 2006, former Vice-President Al Gore said by 2016 it would be too late to do anything, while the Intergovernmental Panel on Climate Change (IPCC) said African farmers would be suffering 50% yield drops by 2020 and the Himalayan glaciers would be gone by 2035. Today, the IPCC is more scientific and cautions against attributing specific weather events to global warming. They recognize that the public loses confidence in science itself when scientists engage in advocacy. But without reliable metrics, it is hard to know how pressing the issue is so someone has to put in some numbers. CO2 has gone down in the United States, though China will remain unchecked, so that is not helping CO2 levels overall. Given that global emissions are likely to rise with China, India, Mexico and other countries exempt from pollution caps, a new paper in Earth's Future says that by 2050, a majority of U.S. coastal areas are likely to be threatened by 30 or more days of flooding each year due to dramatically accelerating impacts from sea level rise. NOAA scientists William Sweet and Joseph Park established a frequency-based benchmark for what they call "tipping points," when so-called nuisance flooding, defined by NOAA's National Weather Service as between one to two feet above local high tide, occurs more than 30 or more times a year. Based on that standard, the NOAA team found that these tipping points will be met or exceeded by 2050 at most of the U.S. coastal areas studied, regardless of sea level rise likely to occur this century. In their study, Sweet and Park used a 1½ to 4 foot set of recent projections for global sea level rise by year 2100 similar to the rise projections of the Intergovernmental Panel for Climate Change, but also accounting for local factors such as the settlement of land, known as subsidence. These regional tipping points will be surpassed in the coming decades in areas with more frequent storms, the report said. These tipping points will be also be exceeded in areas where local sea levels rise more than the global projection of one and half to four feet. This also includes coastal areas like Louisiana where subsidence, which is not a result of by climate change, is causing land to sink below sea level. NOAA tide gauges show the annual rate of daily floods reaching these levels has drastically increased - and are now five to ten times more likely today than they were 50 years ago. "Coastal communities are beginning to experience sunny-day nuisance or urban flooding, much more so than in decades past," said Sweet. "This is due to sea level rise. Unfortunately, once impacts are noticed, they will become commonplace rather quickly. We find that in 30 to 40 years, even modest projections of global sea level rise--1½ feet by the year 2100--will increase instances of daily high tide flooding to a point requiring an active, and potentially costly response and by the end of this century, our projections show that there will be near-daily nuisance flooding in most of the locations that we reviewed." "As communities across the country become increasingly vulnerable to water inundation and flooding, effective risk management is going to become more heavily reliant on environmental data and analysis," said Holly Bamford, Ph.D., NOAA acting assistant secretary for conservation and management. "Businesses, coastal managers, federal, state, and local governments, and non-governmental organizations can use research such as this as another tool as they develop plans to reduce vulnerabilities, adapt to change, and ensure they're resilient against future events." 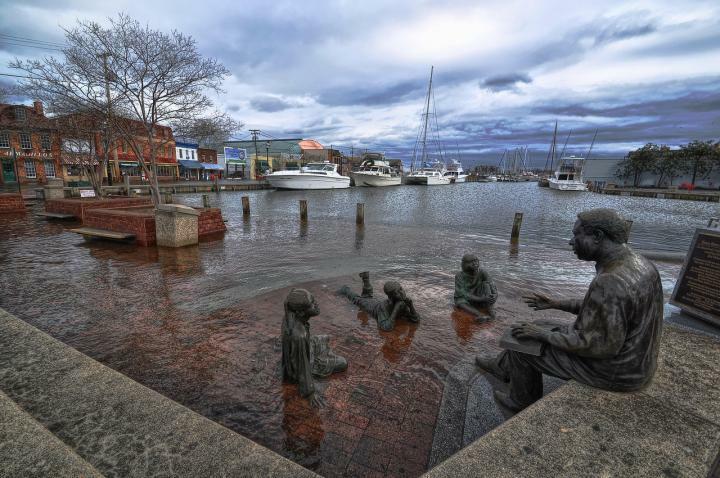 Annapolis, Maryland, pictured here in 2012, is one of three major East Coast urban areas already being faced with nuisance flooding in excess of 30 days per year. With permission from Amy McGovern. "The importance of this research is that it draws attention to the largely neglected part of the frequency of these events. This frequency distribution includes a hazard level referred to as 'nuisance': occasionally costly to clean up, but never catastrophic or perhaps newsworthy," said Earth's Future editor Michael Ellis in accepting the paper for the online journal. Ellis also observed that "the authors use observational data to drive home the important point that nuisance floods (from inundating seas) will cross a tipping point over the next several decades and significantly earlier than the 2100 date that is generally regarded as a target date for damaging levels of sea-level. The paper also raises the interesting question of what frequency of 'nuisance' corresponds to a perception of 'this is no longer a nuisance but a serious hazard due to its rapidly growing and cumulative impacts'." Mitigation decisions could range from retreating further inland to coastal fortification or to a combination of "green" infrastructure using both natural resources such as dunes and wetland, along with "gray" man-made infrastructure such as sea walls and redesigned storm water systems.